Reason's RPG-8: for all your arpeggiation requirements. The Gate Length control on RPG-8 is great, but sometimes you want to vary each note independently so that, for example, the higher notes are shorter than the lower notes. 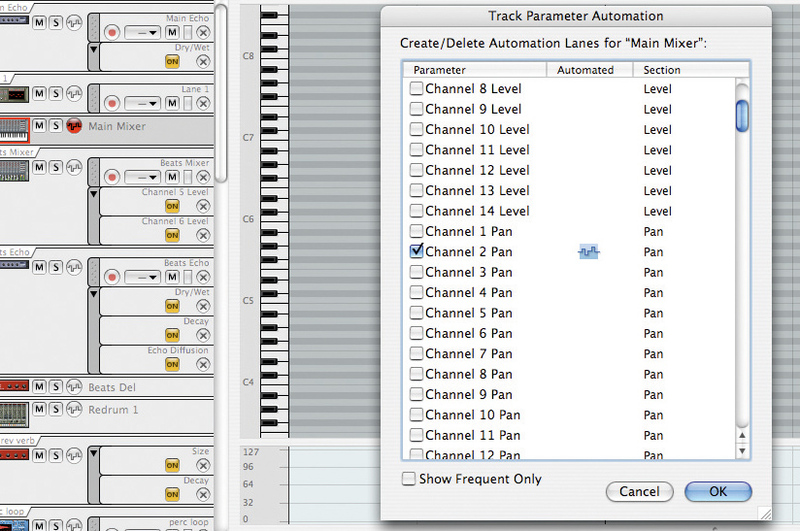 Or maybe you want to just control the length of each note in a loop separately. In this case, you're best off using the Arpeggio Notes To Track function to create a clip. To add an interesting delay effect, use the layering technique from the last tip, setting the Gate Length very short on both, then use the Slide control on the ReGroove Mixer to delay one of the channels. Try panning the two channels left and right slightly for a cool stereo effect. A great way to accent different parts of a track is to alter the arpeggio octave range in real time. So, for example, you could use the one-octave mode for your intro and drops, the two-octave mode for verses, the three-octave mode for your bridge and the four-octave mode for the choruses. Spice up your riffs by simply disengaging the Single Note Repeat button, then overlapping notes occasionally to generate bursts of arpeggio (with Single Note Repeat disengaged, arpeggios are only played when multiple notes are sounded). Alternatively, throw a few held notes over your riff in places for a similar type of effect. Try engaging Hold so that the arpeggio will continue even after all keys are released - this is great for live performance and idea building. And if you hold one note of the previous arpeggio down, and send some more notes to the RPG-8, it will add these new notes to the existing arpeggio, making you sound like a skilled musician! If you want to add a bit of emphasis to an arpeggio, you can modulate the Rate in real time. For rhythmic changes, leave it in Sync mode, or for more crazy effects, try putting it in Free mode and sweeping Hertz instead. This works really well for breakdown effects, and sweeps in short drops. 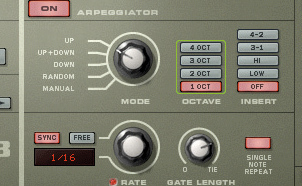 The arpeggiator enables you to add swing, but if you're desperate to get a bit of precision groove template action on your otherwise robotic arpeggios, you'll need to make use of the tried-and-tested Arpeggio Notes To Track function and then assign a ReGroove Mixer channel to the appropriate instrument track. For a lesson in writing simple backing tracks, listen to Blur's Girls & Boys. All you need is a basic one-octave arpeggio to start with, then simply keep changing the root note you feed into RPG-8. Moving up or down in steps of one, two, three, five and seven semitones is never a bad move in pop music. To get the most out of Insert modes 4-2 and 3-1, you need to get the hang of using the right Octave range. For example, while holding down one note, using the two-octave range with 3- 1 won't make any change, whereas the 4-2 Insert mode will produce a nice variation on the basic arpeggio. Practise your own combos. Arpeggiators are designed to be messed around with, so try feeding them some random stuff. For example, experiment with sending each of the MIDI clips in a project to an arpeggiator, including percussion parts and even Dr.REX loops. The former might well fit into your track, but it's fair to say the latter is more likely to generate new ideas. 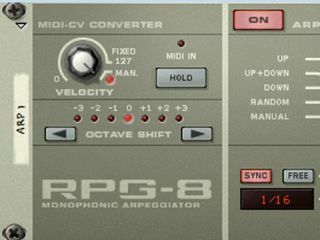 One of the great things about RPG-8 is that, being tempo-syncable, it offers a fantastic way to actually play live electronic basslines, like that on New Order's Blue Monday. In fact, you can even emulate the synth-meisters of old and play live arpeggiated basslines and melodies yourself, with just minimal technical skill. The effect of tempo-synced arpeggios on a track can be enhanced by adding rhythmic panning. You can set this to any tempo you want, but try running it somewhere between quarter-notes and the actual tempo of your arpeggio. For anything faster than quarter-notes, you should usually reduce the furthest panned positions. Read the arpeggiator descriptions in the Reason 4 manual very thoroughly indeed, paying particular attention to the parts describing each function. As you read, try each button out in conjunction with the others. It's a lot of fun, and within about half an hour you'll have a complete understanding of what's what. Liked this? Now read: Propellerhead Reason 5 and Record 1.5: what's new?